The supply chain incorporates all aspects of moving material from the vendor through the manufacturing process to the final customer. The supply chain focuses on vendors, manufacturers, intermediaries, logistical services and the customer. The supply chain is no longer contained within countries' borders, but encompasses all nations, whether they are vendors, manufacturers or customers. In the past decade, China has become a global economic leader and will soon be the world’s largest economy. Economists predict that some of the current developing nations will be some of the most important economic powers in the next decade. As the global supply chain becomes more complex with every passing year, companies must adapt to this change and incorporate them into their supply chain strategies. This change could mean using vendors from developing nations or exporting goods to new markets. 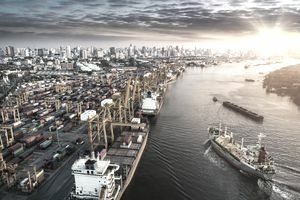 Companies that have traditionally operated within national or regional trading groups may feel ill-equipped to extend their global supply chain. This may be as simple as feeling unable to select and manage a foreign vendor or not knowing how to sell items in a new country. Businesses have to understand that cultural difference plays a deciding role in the success or failure of a venture in a new global region. American businesses have sometimes failed in countries such as Japan which has a very difficult business environment to the US. Companies can overcome these barriers by using local agents to sell the products in a foreign nation or by licensing their products. The licensing of a product is sometimes more beneficial as it allows the licensing company to terminate the agreement if the products fail to be marketed or sold appropriately. Joint ventures can also be a way of entering a new market. By using a partner company’s local expertise the product can have a greater opportunity for success. Most companies who have been selling products within a domestic market do not have the skills or knowledge to sell items in a foreign country. Fortunately, there are facilitators and intermediaries who, for a fee, will aid the launch and marketing of products in a new market. The freight forwarder is concerned with organizing transportation for companies. Their primary task is to combine smaller shipments to create a single large shipment to minimize the shipping costs. Companies using a freight forwarder will benefit as they are charged a much smaller shipping cost than if they had shipped their product independently. The freight forwarder provides other services which are beneficial to the exporting company. The services include documentation, payment, and carrier selection. The export management company offers services to companies that have not exported items before. The EMC offers all the services that a company would have if they had an internal export department. The EMC deals with export documents and operates as the company’s agent in the overseas market. This may include selling the items directly or operating a sales department to process sales orders. The export trading company exports goods for companies who hire them. The trading company will identify and work with companies in a foreign country who will market and sell the products. The export trading company will provide services including export documentation, logistics, and transportation. The export packing company provides a service to companies unfamiliar with exporting. Some countries require specific packaging specifications and the export packer’s knowledge in these matters are invaluable to the novice exporter. In addition, the export packer can advise companies on appropriate design and materials for the packaging of their items. Packing companies can also assist companies in minimizing packaging so that they can maximize the number of items to be shipped and reduce shipping costs. The customs broker can help companies to avoid the pitfalls involved with customs regulations and dealing with the complete customs process. The customs requirements of many countries can be difficult to understand for the novice exporter and the knowledge and experience of the customs broker are vital. Many countries have specific laws and documentation requirements for importing items that are not always obvious to the exporter. The customs broker can offer a company a complete package of services that are essential when a company is exporting to a large number of countries. Because of the complexities of the global supply chain companies can quickly become successful in new markets when they use the experience of facilitators and intermediaries. However, these services add an additional cost to the price of the items being exported.